A terrorist attack was simulated on the DCU Glasnevin campus by An Garda Síochána, the Dublin Fire Brigade, the National Ambulance Service, the Defence Forces and DCU security, on November 16th. The exercise, known as Operation Barracuda, took place in the Nursing Building at the end of the first DCU Open Day this year. The drill included fake hostages, explosives and a terrorist that shot at campus security and the other officials. “Not everyone knew what was going to happen next so people had to react,” said DCU President Professor Brian MacCraith about the staged attack. The drill was aimed at testing how emergency services dealt with mass casualties which could be caused by terrorism. The Defence Force “provided Explosive Ordnance Disposal (bomb disposal) capability for the exercise,” according to Captain P. Molloy. “It is intended to test the ability and interoperability of the emergency services that will come together in the event of a major emergency,” said Deputy Commissioner John Twomey. The operation was done in real time and began with a 999 call to the Garda Control Centre about a serious traffic collision involving a Volvo. Moments later people exited the car and began shooting at what were meant to be innocent onlookers. The Emergency Response Unit then came on the scene and shot dead one of the shooters and the other went inside the building where a hostage situation occurred. 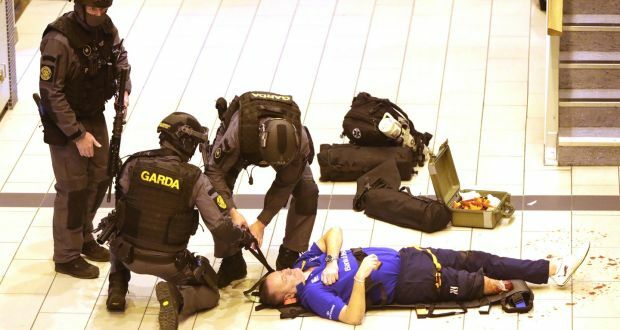 Over 50 people from external agencies, such as first responders, were involved in the simulation which was led by the Gardai and partially organised by DCU’s Chief Operations Officer Dr Declan Rafferty. “We always want to be ready in case something goes wrong. You know what’s happening globally so why should we be complacent like something wouldn’t happen in DCU?,” said MacCraith. DCU were contacted to see if it was possible to run the simulation on campus and were “delighted to be able to assist the State in terms of testing that is,” said MacCraith. Those involved in the simulation and that were outside of DCU faculty “thought it was a fantastic environment to try this out,” according to MacCraith who added that “all the technology worked” for the exercise. “No problems at all” arose in relation to DCU’s response to a terrorism threat continued MacCraith. “Unfortunately, one of our security men got shot dead during the whole thing,” he joked.